Claudia Stack says she came to her interest in sharecropping via the Rosenwald schools she had come to know near her home in southeastern North Carolina. "I knew that African American sharecroppers had contributed greatly to school building, and that these schools played a central role in their communities," she writes in the study guide that accompanies her new documentary film, Sharecrop. As in her previous films, Under the Kudzu, about Rosenwald schools, and Carrie Mae: An American Life, about a woman educated in a Rosenwald school who went on to forty years of teaching, Claudia lets the story unfold in the words of the people who lived it. "When do you work on the farm? All the time! When is there not a time to work? Never!" This is how Dr. Richard T. Newkirk talks about his childhood on his grandparents' North Carolina tobacco farm. He remembers fearing there might be reprisals if local folks found out that his grandparents had actually managed to purchase the land they had initially worked as sharecroppers. He recalls getting up at 3:30 am and being in the fields and barns all day. And deciding early on that he would get an education so he wouldn't spent the rest of his life working like that. 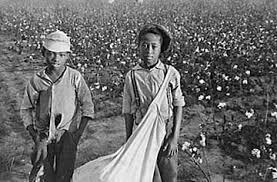 Sylvester Hoover, born in 1957, describes his earliest memory -- of being dragged on a cotton sack through the fields while his mother picked cotton in the heat of the Mississippi Delta. He talks about how families felt trapped in the sharecropping system, knowing that if they scraped together enough money to buy a bus ticket north the agent who sold it to them could call the plantation manager who might well say that the family owed money and, therefore, could not leave. Again and again interviewees talk about the cycle of indebtedness created by sharecropping. Farmers shared the land, the tools and the expertise with the farm owners. The system had the advantage of allowing them to farm without access to capital and without owning land. The only thing they never seemed to share was the profit from their backbreaking work. The people interviewed in Sharecrop are black and white, Cherokee Indian, Southerners and residents of Appalachia, men and women. They describe hard work and unfair practices. But they also recall strong families, friendships that reached across racial lines, kindnesses exchanged. M.C. Ausbon, whose grandfather was a Cherokee fur trapper and whose father was a sharecropper, recalled his parents being community leaders. His father organized and advised other farmers; his mother led the local women in cooking and preserving food that would be shared among all members of the group. Standing in a windblown field, M.C. says "I thought that was how everyone was." Then he adds, wistfully, "Boy, was I wrong." The world evoked in Sharecrop is gone but it touched many lives including of forebears of mine. My Aunt Ivy, born in 1908 in West Texas, wrote in a letter of how she worked all summer to earn the money to buy material so she could make a new dress to wear when she went off to teachers college. What was the work she did? She picked cotton. The photo at the top of the page is Ivy's grandparents on the porch of their home in Garden City, Texas. In the foreground -- cotton. You can see the trailer for Sharecrop and links to the study guide here.